There are a number of 3D printing companies and services for rapid prototyping available to the hobbyist, entrepreneur, start-up company and for production. More are showing up each month offering a variety of 3D printers, 3D printing and buy / sell marketplace services. For this article, we’ll explore the industry leaders that have a proven product and excellent customer satisfaction ratings. For a review of two printers under $200, check out: Best Budget Home 3D Printer . A brief explanation of 3D printing – this is an additive manufacturing process for creating three dimensional (3D) solid objects from a computer model. Note this is different from subtractive processes like milling and sculpting. In the latter, the process begins with a block of material which is larger than the finished product and is gradually reduced until the desired shape is reached. In 3D printing, the process begins with an empty space and layers of material are successively deposited on top of each other to build to the desired shape. This layering has an added cost benefit in that objects can be built for structural strength without having to be 100% solid (e.g., a honeycomb internal structure). Analogous to an electric glue gun, inside the 3D printer, plastic filament travels through a tube to the print head, where it’s heated to a semi-liquid state and extruded with precision. The nozzle diameter at the head determines the minimum amount of material that can used in the 3D printing process. This smaller the diameter, the finer the resolution of the finished product. Similar to 2D printing, CNC milling and other modern technologies, a designer creates the digital representation of the object using a software program or other means. In some instances, multiple photographs of an existing object can be used to create a 3D replica or as the basis for the new digital file. For example, using a set of 360 degree photographs to create a 3D printed object of a persons’ head. Stratasys offers a few family types of personal 3D printers, and a number of models in each family. Their ” Mojo ” family uses a proprietary ” QuickPack Print Engine ” which contains and delivers the model base and support materials to build the 3D printed objects. These are similar to ink cart cartridge on a home document printer. The Print Engine has its own print head in addition to 80 cubic inches of material. This eliminates the need for period cleaning of the nozzles, and makes it (literally) a snap to change materials or simply print many objects. Their Mojo 3D Printer is included in the $7K Mojo Professional 3D Printer Starter Package , along with, QuickPack Print Engine with Ivory P430 ABSplus model material, QuickPack Print Engine with SR-30 soluble support material, WaveWash 55 support cleaning system and Ecoworks tablets. This printer package offers the fastest way for designers, entrepreneurs and small business owners to quickly turn 3D CAD models into real objects. It offers the affordability you need for an office 3D printer, and the quality you’d expect from the leading producer of 3D printers and production systems. The simplicity and ease of use of this design makes it very attractive for novice 3D printers. While this may add some expense, it’s a great feature that with every material change, the Mojo Print Engine provides a fresh print head to ensure optimum part quality. The QuickPack foil bag contains 80 cubic inches of material, which means fewer material changes and more uninterrupted, big idea printing for you. Modeling bases provide a smooth surface on which your 3D print objects grow. Once printing is done, you simply take the recyclable base out of your 3D printer and snap off the model. Above the entry level ” Mojo ” is the ” uPrint ” family, which features the ” SE Plus 3D printer “. This machine uses Fused Deposition Modeling (FDM) Technology to build in ABSplus thermoplastic. Additionally there are nine colors to choose from, making it possible to create realistic prototypes and marketing models. The size and precision of the finished object make them useful to evaluate form, fit and function in everything from ergonomics to manufacturing processes. Two layer thicknesses provide a choice of whether to print an object 30 percent faster or at a finer resolution. Optional dual material bays mean more uninterrupted print time, to maximize throughput without having to replenish materials. 3DSystems is also the parent company for ” Cube “. They position their under $500 Cube 3 model and slightly less expensive Cubify as the family / home / classroom entry printers. One differentiator from the other printers is that the Cube (and the $1,300 larger version, more professional Cube Pro ) can communicate over a WiFi network, eliminating cables. Another interesting feature is the color offerings – it uses material cartridges in 16 different colors including vibrant colors, neutral colors, metallic silver and glow in the dark. The other printer by Cube is “CubeX”, starting at $2499. In addition to the entry model features, this has a larger build capacity. 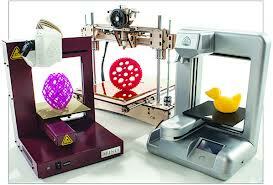 MakerBot is probably the most prevalent of all home 3D printers used in North America. The original MakerBot MP05925EU Replicator Mini ” sells for around $475 on Amazon, and their high-end MakerBot Replicator 2X Experimental costs about $2.5K . Just announced is the ” Replicator 2X “, suggested price of $2,799. Once you have a 3D Printer, you’ll want to get the best use from it. These 3 books from author Joan Horvath are an excellent source of ideas, projects and demonstrations. They will take you from the basics of 3D printing to the advanced techniques. For more information on each of these companies and their various 3D printers, please visit their websites with the links provided above. Also, to hear more from the 3D printing community, check in with the groups on Google+ and LinkedIn.